Pat’s CARSTAR donates minivan to family in need – CAP Services Inc.
Pat’s CARSTAR, 3021 MacArthur Way in Plover, will donate a reconditioned 2008 Kia Sedona minivan to Melissa Zeinert and her family at 3 p.m. Monday, December 19, extending the business’s Recycled Rides tradition into its ninth year. CARSTAR owners Tony and Sharon Kempen as well as former owners Pat and Sandy Arnold will be at the donation along with the Zeinert family, project partners and local leaders. 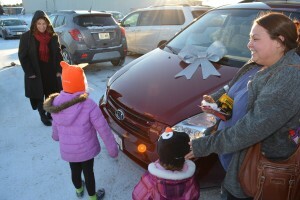 Wisconsin Mutual Insurance helped Pat’s CARSTAR obtain this year’s vehicle. Mark Toyota in Plover and Keystone Automotive in Stevens Point donated parts; FinishMaster donated paint; and Pat’s CARSTAR donated labor to the project. To find a family in need, Pat’s CARSTAR partners with CAP Services, a local nonprofit organization. CAP’s Board of Directors selects a recipient from applications submitted by CAP clients. Melissa Zeinert’s family was chosen from among several applicants. Zeinert has three children ages 6 years, 3 years, and 7 months. Zeinert needs a safe and reliable vehicle for getting to work, school, church and other everyday activities, as well as travel for medical appointments and to visit family. Zeinert’s previous vehicle is a bit of a sore spot for her. She worked hard to get it, researched prices and reviews, bought it herself, made all of her loan payments, maintained full insurance coverage, got its recommended maintenance, and kept the vehicle clean. Even so, the engine blew. “That was a very, very sad day for me,” said Zeinert. Since then, Zeinert has been borrowing a minivan for a couple she knows from her church, but as it has crept past the 200,000 mile mark, it too is encountering some issues. Zeinert’s employer has been understanding of her vehicle issues, but she’d like to be able to pay back their consideration. “I truly want to reciprocate the reliability my employer has shown me and I believe that starts with reliable transportation,” she said. Pat’s CARSTAR’s vehicle donation tradition began with the National Auto Body Council’s (NABC) Recycled Rides program. Recycled Rides, launched in 2007, is a nationwide awareness program where collision repair members of the NABC repair and donate used vehicles to families in need in their communities.